My favorite herb to use in the kitchen is fresh basil. No matter what variety, I love the crisp scent and lively flavor it adds to dishes. Not only is Basil tasty, it’s beautiful! But, it’s so much more than that. Basil has been used for thousands of years for its health benefits, and for good reason. Basil contains a handful of phytochemicals including a carotenoid called beta-caryophyllene. This particular phytochemical gives basil it’s anti-arthritic activity which may be attributed to its anti-inflammatory properties (1). As someone living with an autoimmune disease, I am all about anti-inflammatory properties! Other standout phytochemicals found in basil can actually change gene expression, trigger cell death, and slow cell division (2). This is important when managing and preventing cancer. To help us understand why these are good, I had Alison weigh in . . .
Gene Expression: This process allows a cell to respond to its changing environment. The changing of gene expression can be a positive or negative process. In this case, the properties in basil can essentially change a gene to fight against cancer, rather than fuel it. Trigger Cell Death: This process, called apoptosis, is important to kill off a bad cell before it can become something more dangerous--like cancer. Slow Cell Division: The slowing of cell division can lead to slowing the growth rate of cancer cells, reduce the risk of cancer spread, and stop cancer in its tracks. This dressing is super creamy, yet Plant-Based! Isn’t Alison awesome at explaining all that stuff? In the end, fresh basil is not only tasty, it’s also great for the management and prevention of cancer prevention and reducing inflammation. Want an easy way to incorporate fresh basil into your next meal? Try our Green Goddess Dressing (recipe below). It can be used on a salad, or even a big bowl full of vegetables and whole grains. Or try our Corn Pesto Pizza! 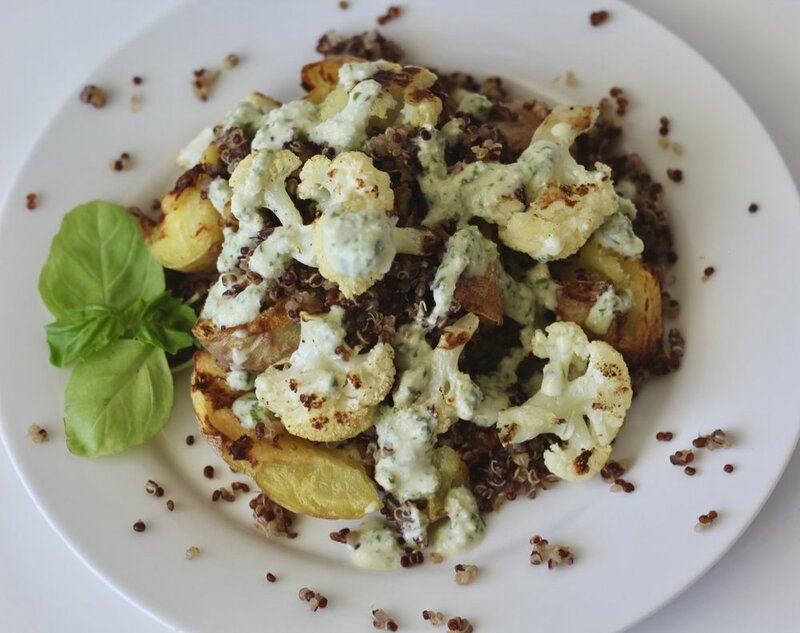 We love the dressing over potatoes, Cauliflower, and quinoa! Begin by soaking the ⅔ cup raw cashews in warm water for at least 10 minutes. Once soaked, drain the water the cashews were soaked in. To a food processor, add the soaked cashews, lemon juice, fresh basil, tahini, maple syrup, mustard, and garlic. Add salt to taste. Depending your flavor, you can also add more tahini for a richer flavor. Or, if you would like a thinner consistency, add water or unsweetened non-dairy milk ½ to 1 tablespoon at a time until reaching desired consistency. Drizzle over an abundance of greens or use as a sauce your favorite dish. Enjoy! Bakshi, Vasudha, and Nazia Begum. “Anti-Arthritic And Anti Inflammatory Activity Of Beta Caryophyllene Against Freund's Complete Adjuvant Induced Arthritis In Wistar Rats.” Journal of Bone Research and Reports, IMedPub, www.bone.imedpub.com/antiarthritic-and-anti-inflammatory-activity-of-beta-caryophyllene-against-freunds-complete-adjuvant-induced-arthritis-in-wistar-rats.php?aid=7220.